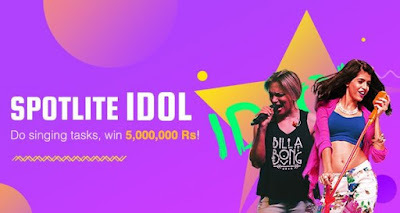 "Spotlite," a global singing app that garnered more than 300,000 Indian users within two weeks in the month of April, is starting an exciting activity called "Spotlite Idol" to find India's next internet-singing sensation. Each and every one has the chance to share the prize pool of 5,000,000 Rupees. "Spotlite Idol" is open to all Indians regardless of age, gender, origin or any other restrictions. No matter if they are music lovers without any professional training, amateur musicians, or prospective stars, Spotlite welcomes them all. "Spotlite" offers a pool of more than 50,000 popular songs authorized by the Big 5 record companies: Universal Music, EMI, Warner Music, Sony Music, and BMG. Your favorite ones can be easily found in Spotlite's base. Best of all you can access all songs and join the app for free. If you are not satisfied with merely recording songs, you can stream live on "Spotlite." After its successful launch in the US market in September 2017, within a month Spotlite attracted millions of users. Later in November 2017, "Spotlite" ranked No.10 in the US music app store. "Spotlite" has four offices all around the world in Los Angeles, Bangalore, Beijing and Hong Kong. In the near future, it looks to launch in new markets including Japan, South Korea, Indonesia, the Middle Eastand Europe. Established in June 2017 as Spotlite Media Inc., "Spotlite" received 10 million US dollars in venture funding from Sequoia Capital and BlueRun. The founding members of Spotlite Media Inc. were former employees of Microsoft, Alibaba, Baidu, Universal Music and Roc Nation.